Today’s rate the dress is brought to you courtesy of the unprecedented heatwave that is hitting New Zealand. It’s so bright and sunny that I picked an equally bright and sunny dress to go with it – though I wouldn’t want to be wearing the heavy silk of this weeks Rate the Dress in the heat! I’m rather famous/notorious for being a fan of yellow, and I try not to lean into that too much with Rate the Dress. 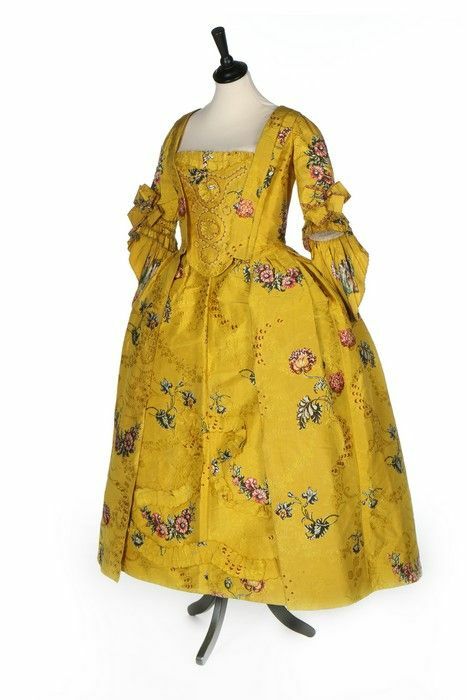 I wouldn’t be providing an accurate view of 18th century fashion if I didn’t show you the occasional bright yellow dress though, because there are so many of them! 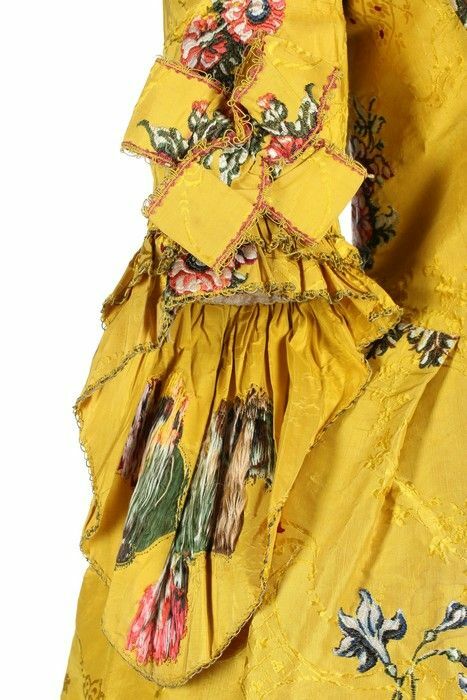 This Anglaise is notable for its extremely vivid yellow hue: bright even for a century where saturated yellow dresses were a major fashion feature. The yellow silk features brocaded patterning of lush flowers in shades of pink and green. 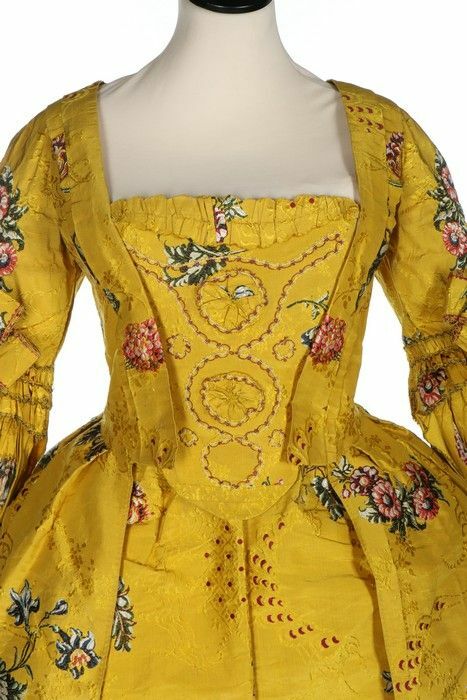 The patterning is placed symmetrically across the back of the dress, drawing the eye to the precise stitched-down pleats that flow down the back of the bodice, into the skirt, with no waist seam: the defining feature of an Anglaise or English Gown. The same symmetrical placement is repeated in the front of the bodice, but the stomacher, skirt, and petticoat abandon attempts to mirror the fabric patterning. 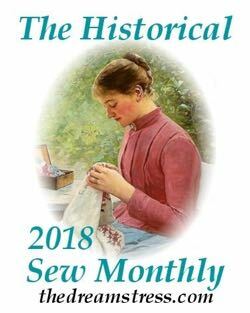 Though the fabric is no longer symmetrical, the trim of both stomacher and petticoat is. The stomacher uses a trim placement very similar to the one that inspired my frou-frou stomacher, though the end result is quite different. 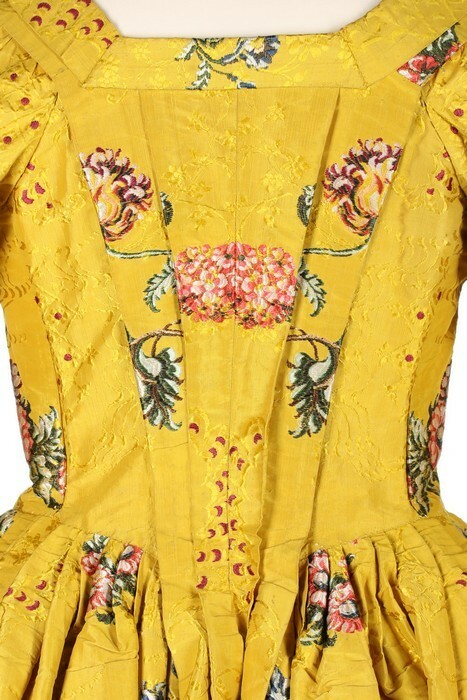 The overall trimming of the dress is quite subdued, allowing the exuberance of the florals and the colour to speak for the dress. As far as my tastes are concerned, this is more like it. Both the shape and color are lovely. I can’t wear such a vivid yellow, but I adore looking at it. It would be splendid with a frothy pair of lace engageantes billowing from the bottoms of the sleeves. I’m not sure that the trim motifs on the stomacher go that well with the fabric print on the rest of the gown, but they are not terribly obtrusive, so that’s a minor point. What a comforting set of images in the depths of midwinter! It must have been quite challenging to accomplish such careful placement of the fabric print. I adore the color and pretty much love anything 18th century. 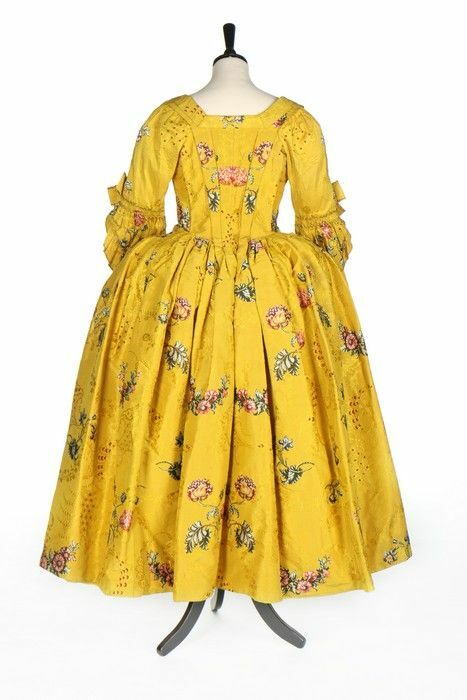 This isn’t my favorite 18th century dress I’ve seen, something about the trimming on the stomacher just isn’t doing it for me, so I can’t give it a perfect score, but it’s still beautiful! Wow! What kind of natural dye would be that vivid? I love the back symmetry – they took some time to do the folding and tucking to make it just so. The trim is interesting – they clearly didn’t want to interfere with the splendor of the fabric. As an example of its time, this is perfect. White sleeve ruffles, a fichu, and some green Moroccan leather shoes and it’s party time! I love the bright, cheery color and pretty florals. I want to reach out and touch the silk. 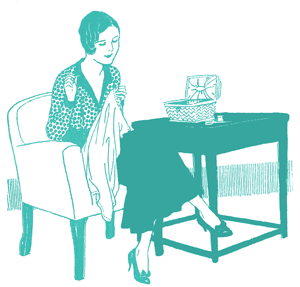 The low, square neckline is lovely, as are the sleeves. The only thing I’d change is the stomacher design, which doesn’t quite match with the flowers. I’d still volunteer to wear this, should they need me! Interestingly yellow is the favourite colour of only 2% of people. This is beautiful! Just what I needed on a day like this, we have yet more snow forecast here today. I think I would prefer a flat stomacher instead of the rosettes just because I feel it detracts from the pattern. I like the bright colour, even though I’m in England where it is very dull and grey just now, but I can’t understand why they’d go to such trouble to pattern match the back and then just give up in the front. I like the work on the stomacher, and overall the dress is a good shape and fine work, but let down by the front skirt. I totally agree, I was thinking the same thing! I’d go for 8.5 out of 10 myself, because I really like the robe, but I think I’d like a different stomacher and petticoat. 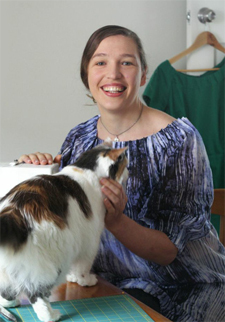 Beautiful dress – I love it! The pattern matching on the back struck me first, huge amount of time and fabric needed to do that! Then I thought must have been a brunette. A blonde would disappear. What a fun dress! While it’s certainly conventionally pretty, the color gives it so much punch. Normally, I might not like the large, angular sleeve bows, but they fit this dress’ personality – ladylike, but extroverted. I feel more cheery just looking at it. I love this dress even though I’m not a big fan of yellow in general. I really love when a great fabric is allowed to speak for itself in a piece without too much added to it in the way of trim. I love it! I love how the fabric has the insane brightness of something Provençal but because of something else, ( je ne sais quoi…) retains Englishness. I love this dress. I love yellow dresses, I feel they are perfect for summer. Also, yellow dresses are perfect on my sister. Oh, wow. I’m normally not a fan of yellow at all (I think the only thing I like less is orange), but I’m completely willing to forgive it here, because I actually love this! It feels like all the colours in the fabric are trying to call back something I must have seen as a tiny tailor – I just can’t figure out what! I’m not usually a fan of yellow, but this one works, and like you said it’s so bright and cheery and right now it’s not bright and cheery here. Not at all. This gown is to my ‘winter blues’ what smelling salts must be to a fainting person 😉 Can’t help but feel cheery when something like this hits you in the face! 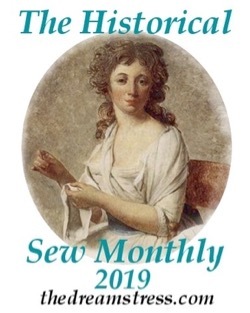 I might be a little partial though because I have some vibrant yellow floral cotton that will hopefully be a trimmed sacque this spring. The silk is so much more elegant though and the back patterning is so delicious. 10/10 for sheer unapologetic cheerfulness! I love this dress! I wear lots of yellow, it makes me happy. This dress is just lovely. The work on it is inspiring. 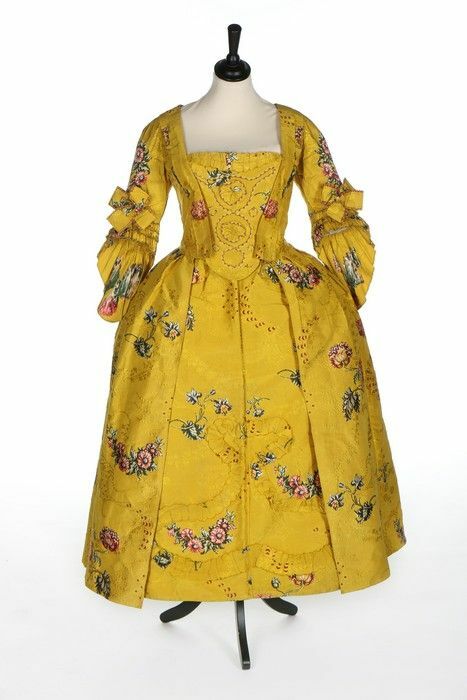 I would love to have seen this on a 18th century real lady, complete and appropriately coiffed, with jewels and shoes. To me this dress looks short? Maybe it’s just me. I love the boudice and sleeves. It’s all great. This dress definitely flies in the face of the people-only-wore-drab-colors-in-the-past myth. What a fabulous, bright yellow. It is not a shade I’d wear myself, but it is so intense and cheerful, like a literal ray of sunshine. The workmanship is amazing too.